The first time I saw gum paste sugar flowers I did not believe that I would ever be able to make them. They looked so delicate that I thought I would need years of training to make anything as I saw. However, the tutor explained it step by step, and I found myself producing some lovely flowers. So, there is no reason why, with the right instructions and plenty of practice, you shouldn’t also do exactly what I did. To make sugar flowers, you will need to select a way to learn that fits the time you have available and which suits your budget then you will be able to find out how to make flowers from gum paste which is rolled, cut & shaped with tools and assembled to replicate your favorite flowers. You don’t need to be artistic to be able to make sugar flowers, but you may discover you have talents you never knew you had. However, if you are artistic, then it is another skill where you will be able to put your unique mark on the sugar gum paste flowers you produce. The majority of cakes that are for a special occasion such as a wedding are decorated with gum paste sugar flowers and made by someone who has taken the trouble to learn the skill, and they look amazing. Admittedly, making sugar flowers for a celebration cake takes time and work. However, if you have gone to all the trouble of baking a fantastic cake do you want to decorate it with plastic flowers and plastic ornaments? If you learn how to make gum paste sugar flowers, you will be able to give any cake you create the professional finish it deserves. To be able to do that you will need to learn how to make the sugar flowers from scratch. There are no shortcuts, but the rewards are well worth investing your time and patience into learning the skills needed. The first thing you will need to do is find a way to learn that suits you. There are many ways you can learn how to make gum paste sugar flowers and some are better than others. You need to consider the amount of time you have to devote to learning and the way to learn that suits you best so let’s look at some of the methods available. There are books you can buy that will give you “step-by-step” instructions on how to make them, and I have bought them myself, but I have always found that certain things have been left out and they are not always easy to follow. The photos are usually, but the downside is that you can’t ask questions about the parts you are not sure of. I love books, and I have a small collection of books by famous sugar artists. While I was still learning how to make cakes and decorate them with sugar flowers, because books about sugar flowers have a lot of lovely photos in them, I found that they inspired me to think of my own ideas for cake designs rather than using them actually to learn how to make the flowers. A gum paste sugar flower class at an adult education facility is a great way to learn, and I have taught many of them myself. Students like them because the teacher is in the room with them and they can ask questions about the things they were not sure of. Unfortunately, as much as I asked students to take notes about the techniques, they were learning they never did, and the result was that the beginning of each lesson was taken up with going over the previous lesson because by the time the students got home they had forgotten what I had told them. To learn that way means attending a class once or twice a week for many weeks to learn all the techniques for making a wide range of flowers. Multi-day courses at a top decorating school which costs a lot of money and if it isn’t near where you live you have traveling expenses (if it was a long way then plane fares), hotel and meal costs. That sounds to me like a lot of money to spend, and you may only learn how to make a couple of flowers on each course so to learn more you would have to pay out again to return for more courses. My preferred way of learning is by video and by that I don’t mean a video made by an amateur youtube sugar flower artist. Unfortunately, anyone who has attempted made a sugar flower thinks they can instruct other people on how to make them. They are poorly done and understanding what they are doing and saying is sometimes quite tricky. What you need is a video that you can learn from at your own pace and in your own time. An over-the-shoulder video made by an experienced gum paste sugar flower teacher Someone who can teach you all the techniques you need to begin making flowers and one you can see what is being shown and understand what is being said. You will feel that you have your own personal tutor in the room with you guiding you through each stage of flower making. Learn at your own pace not the pace of the fastest student in the class or have to wait for the slowest – there will be no pressure to keep up with the rest of a class because you can set your own pace. Follow step-by-step instructions you will be looking over the teacher’s shoulder and will be able to follow it closely rather than sit in a classroom where you most likely won’t be able to see properly and wonder what is happening. Repeat any part of the process as many times as you like so if you don’t get it the first time you can repeat the process over and over again, as many times as you want, until you do get it. A video is the most economical way to learn if you compare it to an expensive multi-day course where you have to find the cost of course fees, traveling, hotel and food expenses plus buying essential tools and materials and then do it all over again for the next set of flowers. There are no hidden costs if you use a video, just the tools, materials and the price of the video itself. The one sugar flower that everyone who wants to make is a rose. 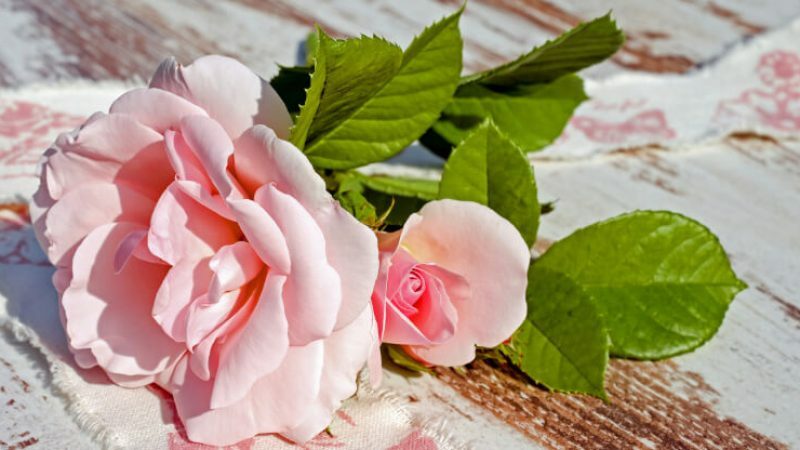 If you look at a rose it seems as if it would be a complicated flower to make but like everything else, if you follow step-by-step instructions then all you have to do is practice making it, and before very long you too will be able to produce a sugar replica of this beautiful flower. Making roses when you start making sugar flowers, will enable you to master a lot of techniques that you will use when you make other flowers. Also, learning how to make blossoms, it will give you a lot more useful techniques so a video course that teaches you how to make both will provide a good foundation in learning the skills you will need to make a range of different flowers. If you would like to learn with this type of video, I have produced a sugar flowers for beginners video course that focuses on Roses and Blossoms that will teach you all the basic skills you will need to make Gum Paste Sugar Flowers. The next thing is to gather together the tools and materials you will need to make sugar flowers, and you need to begin with gum paste. 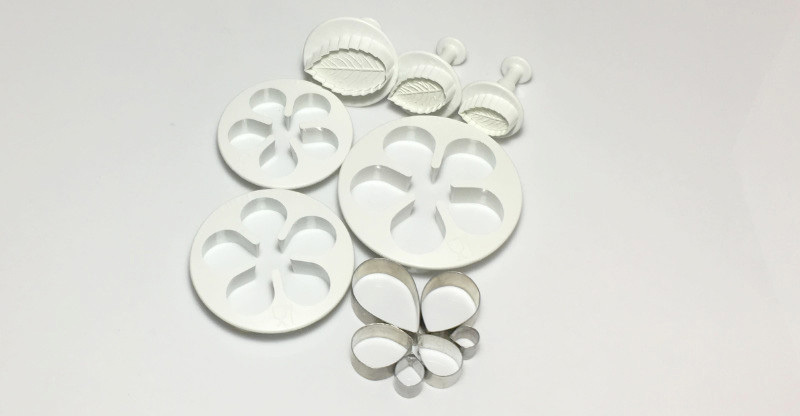 Before making any flowers, you will need some materials and tools to start your new project, and the first thing will be to make some gum paste. I know you have the choice to either make your own gum paste or to buy ready-made paste but if you are learning how to make sugar flowers I think it is a good thing to know how to make your own right from the beginning. First, take into consideration you are going to start a new venture, and the last thing you need to do is to invest a massive amount of money into it before you get going. It’s off-putting if you decide to do something and you need to lay out a small fortune before you begin. Second, if you get enthusiastic about new skills you learn then if you are anything like I was, you will need a lot of paste even during the first few weeks. You will need to spend a little money to buy the ingredients for the gum paste but once you have them you will have enough to make several batches so make sure you seal the containers after use, and they will keep. I find that it works out far more economical than buying ready-made paste. If you run out of gum paste in the middle of a project and you cannot get to the suppliers to buy more, if you know how to make your own, you will always have the ingredients so you can make more straight away. I have never liked working with ready-made gum paste but that is personal preference, and I know a lot of people who feel the same way, but I am sure you will discover your own preference. Click here for an easy gum paste recipe and everything you need to know about making gum paste. Once you have the gum, paste the next thing is to buy some basic cutters and tools. The best way to start off making sugar flowers is to use cutters for the petals and the leaves. Once you have decided how you are going to learn and what flowers you will start with then, you will need to buy the cutters you need. If you are going to follow a video, then I am sure that once you have bought the video, it will come with a list of cutters and materials you will need to complete the projects. There are a couple of ways that you can make roses, and it is a good idea to follow a video that tells you how to use the different types of cutters. Making roses with individual petals results in a beautiful rose that with practice is very realistic. You can, however, make a rose by cutting out several petals at a time. The result is very good, and the advantage of doing it that way is that it is much quicker to make and if you require a large number of roses, for example, for a wedding cake then it is much more practical to make them that way. If you intend to make cakes to sell then, clients may not be willing to pay for the time that it would take to make them one petal at a time. There is also a way to make sugar flowers without cutters. Making sugar flowers without cutters is the next step if you want to make sugar flowers for an artistic endeavor; however, I wouldn’t recommend that you start off doing it that way. The best way to start learning how to make them is to use cutters and get used to handling the gum paste to make the flowers. Once you have mastered the art and can make perfect flowers, if you wish to take your artistic skills up a level, then is the time to learn how to make them without cutters. Before you start, you will also need to buy a few basic tools. 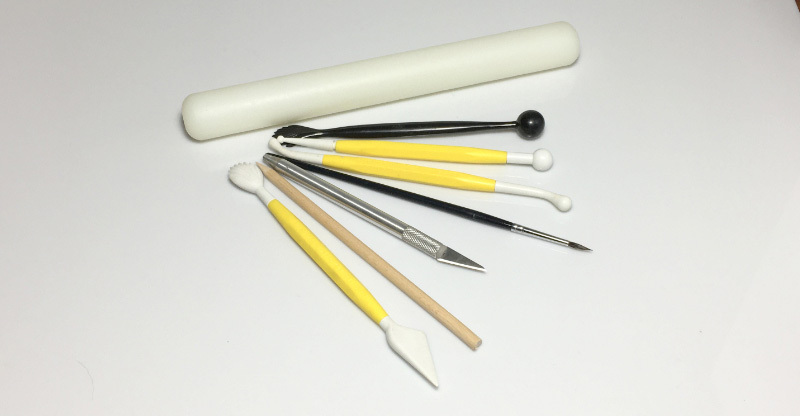 You can buy Flower making tools from a local cake supply store, or you can buy them from many online stores. If you can’t find an online supplier, then I do know that Amazon has everything you would need. From the top, a small non-stick flower paste rolling pin, large ball & shell tool, a tool with two ball sizes and a bone tool. Next, a small paint brush, a craft knife, a wooden dowel, and a blade & shell tool. These tools are used for rolling, cutting, veining, smoothing and shaping. Most people prefer to buy basic, essential tools when they start making sugar flowers because there will be several other things to buy as well. However, if you are prepared to spend more money, you could buy a complete set of tools. If you read my blog post on ‘How to Make Sugar Flowers at Home‘, you will find all the information you need about which tools to buy. If you learn how to make some basic flowers to start your venture into sugar flower making, then you will be surprised at what they can be used for. If you choose to take a course on making roses and blossoms when you have mastered them you will be surprised to know that you have learned enough flowers to decorate a wedding cake. Why? Because the majority of wedding cakes and special occasion celebration cakes are usually decorated with roses and blossoms and you will have learned enough to decorate cakes for family and friends and even other people. Apart from the satisfaction of being able to master the craft of making sugar flowers, there is always the possibility of either being able to find a job making flowers at a bakery that specializes in celebration cakes or setting up your own business. Because so few people can be bothered with spending the time to learn how to make them your skills will be unique and there will always be a demand for them. I know it takes money to set up a bakery, but you could always start small as I said with making for friends and family then if you feel you could take it further then look into setting yourself up as a cake maker and decorator. There is also another way you could make money from your new-found hobby. If bakers offer the service of making special celebration cakes they usually employ a full-time sugar flower maker or buy them from someone who works freelance and makes them at home. Another way you can make money from making gum paste sugar flowers is to sell them through online websites. I searched the web for websites that sell ready-made sugar flowers (without the cake), and I came across a site called Etsy, and I am sure there must be more. 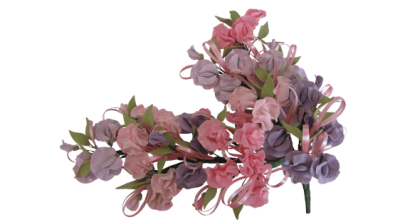 If you go to Etsy and search for sugar flowers and you will be amazed at how much even a small spray of roses or individual flowers costs. I know cake makers buy from them if they don’t have the skills or don’t have time to make the flowers themselves. Books – for pictorial step-by-step instructions but sometimes lacking the finer details needed to learn easily. Adult education classes – will need to attend for many weeks to acquire all the techniques. A video – by an experienced sugar flower tutor, at a very reasonable price, giving you over-the-shoulder tuition that will teach you the techniques needed to begin learning the art of sugar flower making. I have given a link to a good gum paste recipe and explained how to find out what tools and cutters you will need to start. Also, I have suggested ways that you can earn money when you have become proficient at making them. I hope I have answered some of the questions you may have had about how to begin making gum paste sugar flowers.